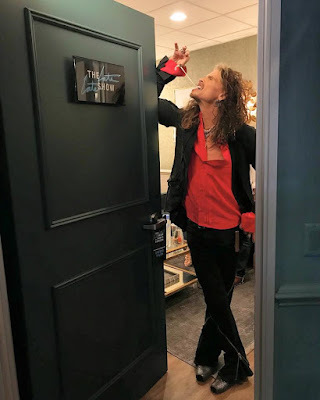 Steven Tyler was among the guests on the May 17 episode of CBS-TV’s The Late Late Show With James Corden, and video from the broadcast is streaming online. The Aerosmith rocker joined Corden for a Truth Or Dare-like game called “Spill Your Guts Or Fill Your Guts”, in which the two pose very personal questions to each other and the choice is simple: answer honestly or eat what's in front of you – which was a table of frightening food choices including a block of head cheese, cow intestines, Vienna sausage juice, and pig jelly, among others. The singer later returned for the show’s regular couch interview portion alongside fellow guest and Deadpool 2 star Morena Baccarin, where he shared tales of visits to Disney World and the time he crashed a bar to join a cover band while they were in the middle of an Aerosmith classic. Directed by Casey Tebo, the project traces the Aerosmith singer’s path during the creation of his 2016 debut country solo studio album, “We're All Somebody From Somewhere”, and the accompanying “Out On A Limb” tour. Tyler will launch a 2018 solo tour of North America in Lewiston, NY on June 12.